Several episodes of the TV show were edited into two straight-to-video movies: one named Dink The Little Dinosaur (1989); the other named Land of No Return (1994). These specials were only ever released on VHS, with a handful of the TV episodes (mostly in the U.S.) also seeing a home release. However, there was no DVD release for either the original TV series or the two made-for-video movies for a long time. The show was broadcast as late as 2001 on the UK Boomerang channel. 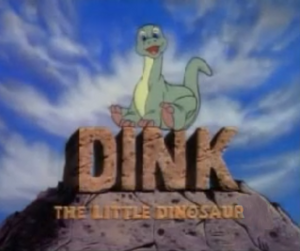 On October 10, 2017, Warner Archive released the whole series on DVD titled Dink the Little Dinosaur: The Complete Series, making all the episodes available for public viewing once again.